We received the following email along with a photo of the Atkinson Cycle engine constructed by Dave Sage of Mississauga ON Canada. It is a beautiful engine and we thank Dave for Sharing it with us. 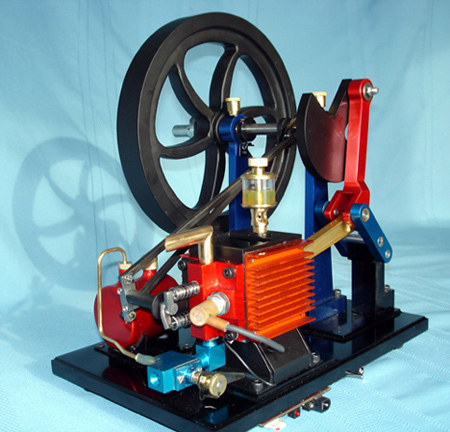 . .
Just though I'd pass along a picture of my newly finished Atkinson Cycle engine. It features anodized aluminum parts. In particular, a different color for each of the moving parts to bring attention to the unusual mechanism. Painted parts are powder coated for durability. I put heat sinks on sides of the normally ugly water hopper. They also help the cooling. I designed my own microprocessor controlled multi-spark electronic ignition triggered by a Hall Effect Sensor. The senser, barely visible on the left column, is triggered by a small magnet in a ring on the crankshaft. The wire for the sensor are not visible as they are routed through a long hole drilled inside the column and come out under the base plate. The batteries and electronic circuit board are low profils and mounted on the bottom of the thin base plate so they are barely visible. The only wires showing are the JV lead and a small ground wire (which now that I see it in the picture I will hide as well). The microprocessor also monitors battery condition and controls battery charging. I can modify the processor program (spark duration, timing, rev limiter, battery charge profile etc.) by plugging in a programmer to a small connector on the circuit board which is accessible from the side. PS: One of the errors I found was the profile of the intake cam. It wasn't until yesterday I noticed that there was a note from another builder on your website concerning this, along with a picture of his engine. So I guess you know about that issue. I suppose the cam would work as in the book but only if you left a lot of backlash in the pushrod so only the tip of the cam was useful. I didn't feel comfortable doing that - just not good practice. In the end the cam was reduced to something with very little lift and duration but it matches the requirement of the short intake stroke fairly well now. I could only get a very small amount of compression before the modification. The other issue that comes to mind is the measurements around the connecting rod (in red on my engine). Something didn't make sense to me so I re-drew the arm with AutoCAD. The measurements and the angles between the holes cannot be made to coincide. In the end, I figured the distance between the holes was the important aspect so I corrected for that. You might want to re-draw that with CAD to figure it out exactly. I'll try to describe the problem more clearly to you when I have access to my notes and my CAD drawings.